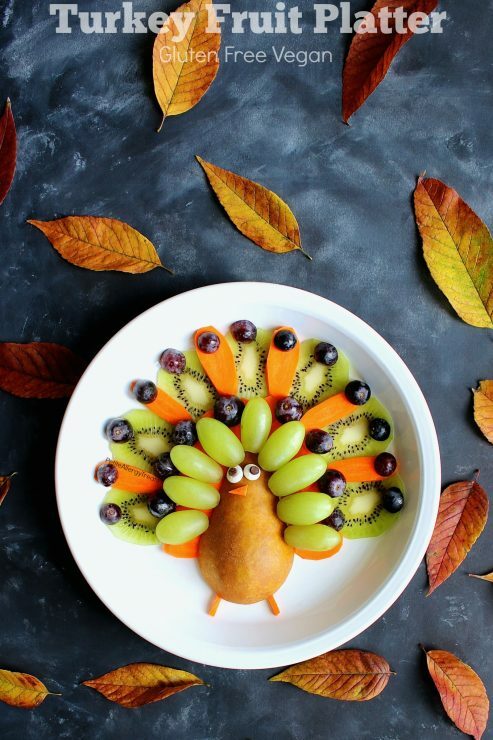 Halloween is the time of year people play with their food. This is when all the adults like to come out and play turning into vampires, zombies and freaks of all shapes and sizes. My kids are still pretty young so I’m keeping things fun and PG with recipes. 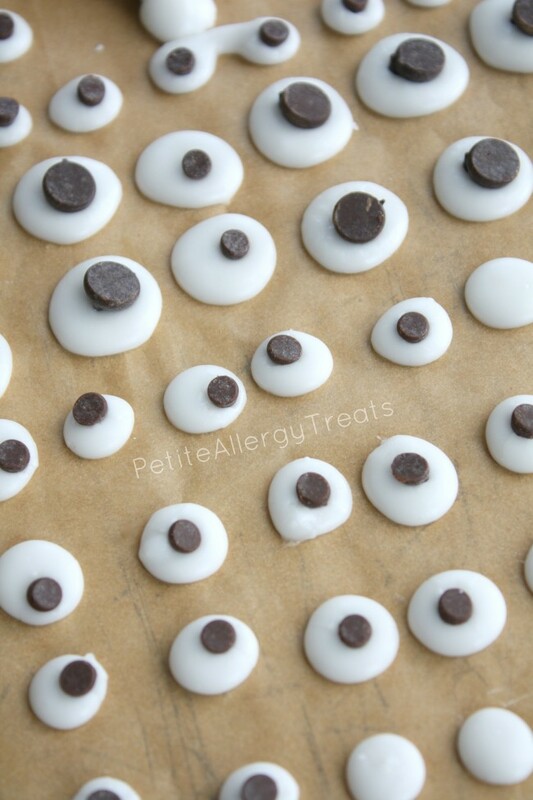 These homemade googly eyes are one of those necessary things allergy parents want to replicate to be cool. Not really. We know we’re cool. But we want our kids to feel cool and special too! 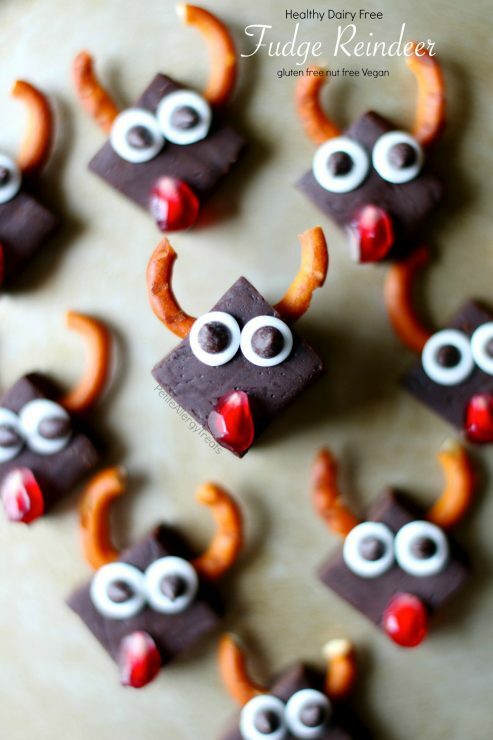 You are a super star allergy parent in my book whether you make these or not. Food Allergy parents are the Jack of All Trades for all things food related. And we want our kids to feel special and included. This can be difficult with egg based frostings and icing. Not to mention those beautiful sprinkles and other decorative things like candy eyes. If you’re looking for egg free icings, you’re in the right place. 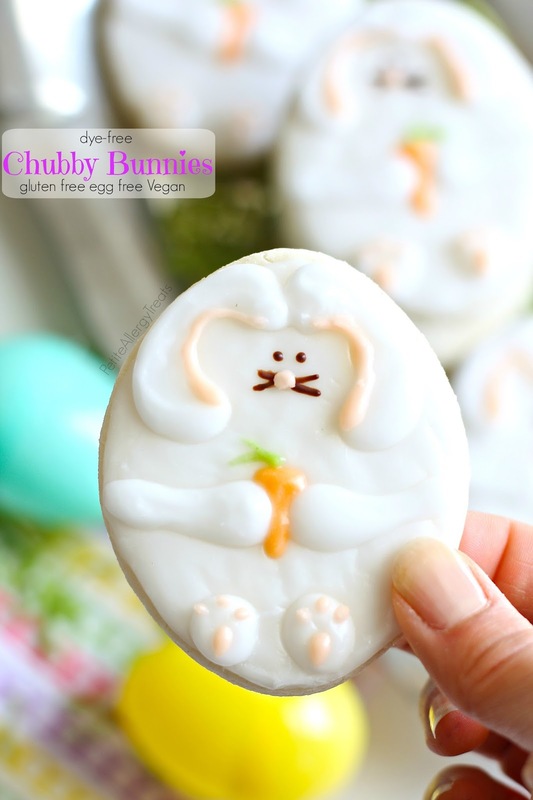 I made a few recipes with my egg free royal icing awhile back like Chubby Bunnies and one of my favorite holiday classics, a real Gluten Free Vegan Gingerbread House. These eyes are made from the same idea but I took it one step further and used only water for liquid. Feel free to make changes since there are some other recipes that are similar and work beautifully as well. 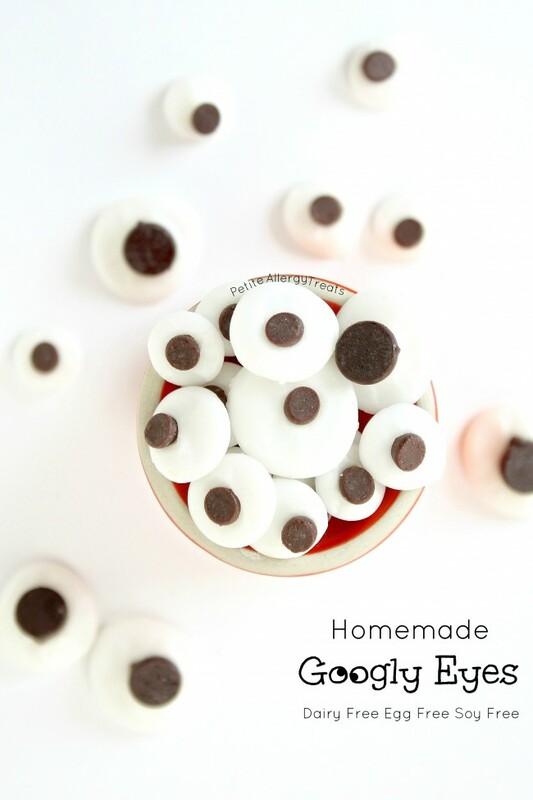 The whole goggly eye decorating has really started to shine through fun cupcake and other creative party ideas funnelled through Pinterest. This is where the some of the inspiration came from. There are plenty of recipes out there but Your Homebased Mom and Forks & Beans are the ones that really stood out for me. I originally created these with a Shaun the Sheep post in mind but haven’t gotten to it yet. This was the reason the chocolate chips are pointed side down. Feel free to flip your chips however you please. Mix powdered sugar and water until smooth consistency. Glaze will be thick. 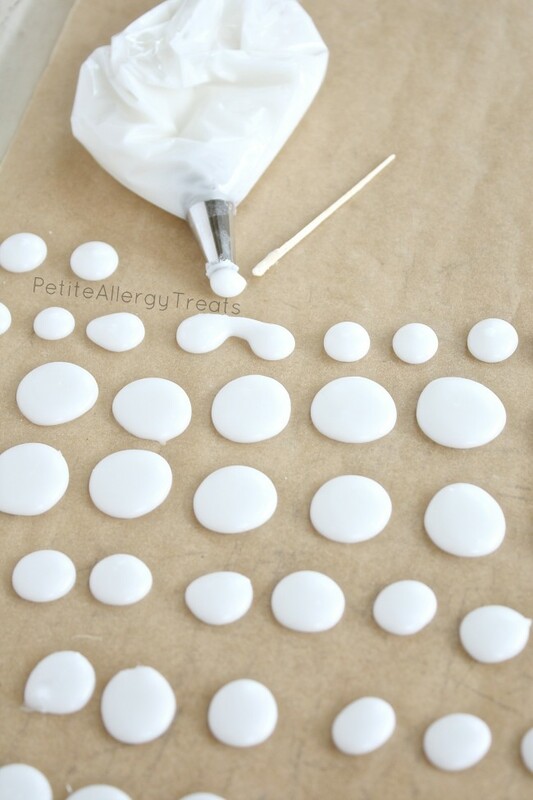 Pipe on to parchment paper using a just ziplock bag with a small corner cutoff or a decorating tip could be used for more control. Insert a chocolate chip point side down. Move chip off center for more of a googly eye effect. FUN! I’m seeing these googly eyes everywhere! Love that you can make them at home! I cannot believe how easy and fun this is! I think this would be a great project for my twelve year old, she’d have a ball! Laura…these are sooo much fun! Perfect for Halloween! Cuteness overload!! I can think of all kinds of ways to use these adorable little googgly eyes. You are so darn creative, Laura! These look so perfect and I love how few ingredients there are! Ahhh how fun are these?? Perfect for all kinds of fun food creations!! These are so cute! Love the simple ingredient list! Love these! And 3 ingredients!! Plus, we can avoid all the dyes and chemicals in those store bought ones! Win, win! Thanks.